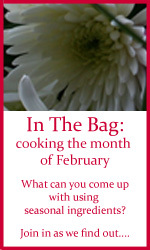 Head on over to Real Epicurean, this month’s host, for entry details. The Frugal Cook…In a Book! Should be a great event. Hi Soma, don’t forget you don’t have to use all 3, so if you can only find one of the fruits to use with the cream that will be fine. You can all substitute with something else. do I need to register first to enter this event? I just found out about this, and was intrigued to give it a go, eventhough I only have one week to do it. I have always wanted to try baking with pomegranate. Hi ice tea – nope, no need to register; just blog about your dish and send the details to Scott over at Real Epicurean before the closing date. I’m looking forward to seeing what you bake!